Don't miss this seminar on the essentials of income tax for individual artists of all disciplines. Learn how artists and artists groups can efficiently track income and expense throughout the year and how to correctly file their taxes. Topics will include record keeping, form 1040, Schedule C, and self-employment schedule, deductions, hobby losses, home offices and more. 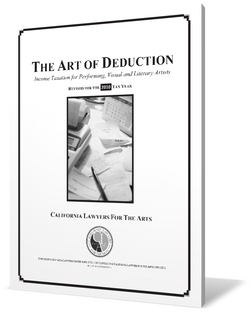 "The Art of Deduction" 28-page workbook (value $19.95) is included with the admission fee. Jon Martin is a self-employed Certified Public Accountant as well as a licensed attorney (inactive). He graduated from U.C. Santa Barbara with a degree in Business/Economics. He moved to Sacramento to pursue his law degree at McGeorge School of Law. In his twenty-eight years in accounting Jon’s practice has focused on tax and financial planning for closely held businesses and self-employed individuals in a variety of industries.